Last night's Gazan Fell Short rocket was quickly followed this evening (Sunday) by another Gazan rocket flung in the customary terrorist way in the general direction of anything Israeli. This evening's missile got as far as southern Israel's Sha'ar HaNegev region, home to some 6,000 long-suffering, rocket-weary residents. There, its approach triggered rocket alert sirens from the Color Red/Tzeva Adom in-bound rocket detection system, sending many residents and their families rushing to bomb shelters. It appears the rocket exploded harmlessly in an open area, causing neither injuries nor property damage. 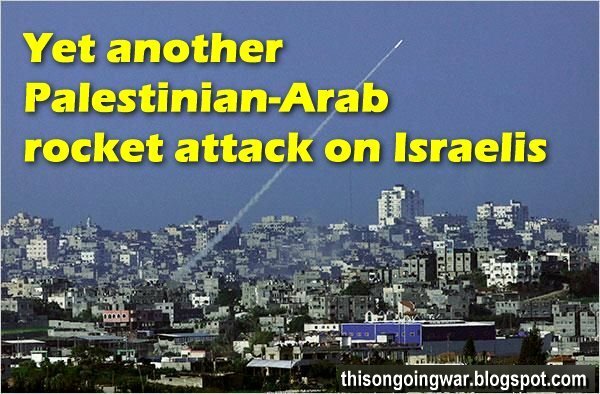 This, it is important to remember, was never the intention of the terrorists who fire off such rockets; their goal is to cause pain, death, fear and disruption to Israeli life. Many thousands of such rockets have been despatched into, and in the general direction of, Israel since Hamas grabbed control of the Gaza Strip in 2007. They have no discernible military objective, but serve strictly terrorist goals.